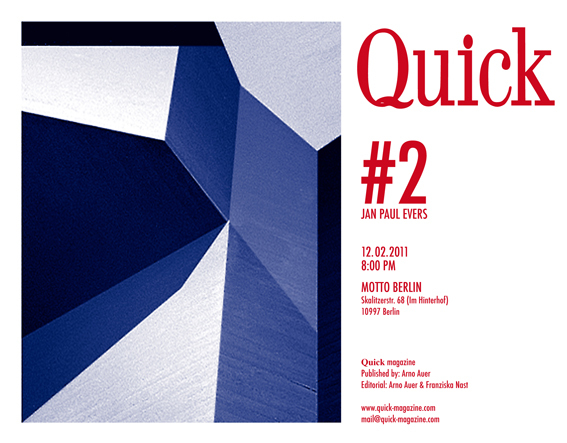 This issue will be presented by artist, Jan Paul Evers and publisher of Quick Magazine, Arno Auer. Limited edition prints from Quick #1 – Julian Stalbohm: from the series: famous crashs reenacted by xerox will also be presented. This entry was posted	on Monday, February 7th, 2011 at 6:43 pm	and is filed under art, magazines, Motto Berlin event, stencil printing. You can follow any responses to this entry through the RSS 2.0 feed.